Made from the same material as professional football helmets, these rugged probe handles have endurance designed in to provide long life. Tip designed for easy penetration into soft and semi-frozen objects. Made from rugged 304 stainless steel. Tip rated to 900°C (1650°F). Fast Response Probe:(RT)Special small diameter ( 1/16") tip designed for fast response. Made from 304 stainless steel. Tip rated to 900°C (1600°F). 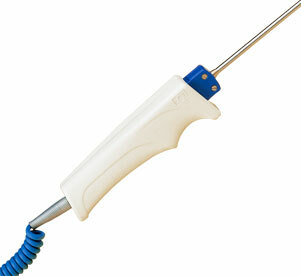 Nota: Rated temperature is dependent on thermocouple type, sheath diameter and environment.